On October 20, The Getty Research Institute will present the world premiere screening of Visionaries, the newest episode from PBS's award-winning documentary series, Craft in America. That episode features UC Santa Cruz arts alumna and book artist Felicia Rice, along with weaver Kay Sekimachi; textile designer and founder of LongHouse Reserve, Jack Lenor Larsen; collector Forrest L. Merrill; and artists of Black Mountain College. It will air on PBS later this year, beginning on December 18. The night before the screening, Rice will also be featured in conversation with PBS producer Carol Sauvion at the Craft in America Center in Los Angeles. 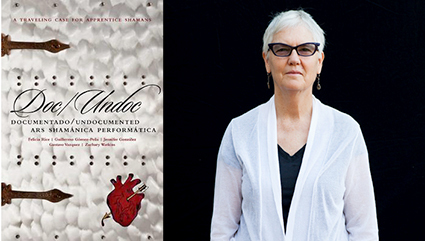 They will discuss the UCSC alumna’s 40-year career as an artist and collaborator. Rice (Cowell '78) received her degree from UC Santa Cruz as an independent major in Fine Art Printing. Her work is currently featured in Artists and Their Books / Books and Their Artists, an exhibition now running at the Getty Research Institute through October 28. In 1977, while still a student, she also founded Moving Parts Press in a garage downtown and began her career as a printer, teacher, literary/fine arts publisher, and book artist. Work from Moving Parts Press has been included in exhibitions and collections both nationally and internationally--from book shows in New York and Frankfurt to the Victoria & Albert Museum. Moving Parts Press has also received numerous awards and grants from organizations that include the National Endowment for the Arts and the French Ministry of Culture.